The main purpose of this app is to keep the user up to date with the latest trip information. Speed, heading, altitude, and various important trip information are made easily visible. Even if you are in another application, GPS Trip Panel will display a dashboard popup notifying the user of the current speed and heading. You can also make this popup “stick” so that you can manipulate maps and still be informed of the speed and heading. This app has other neat features aimed at delivering a superior GPS experience compared to the competition. 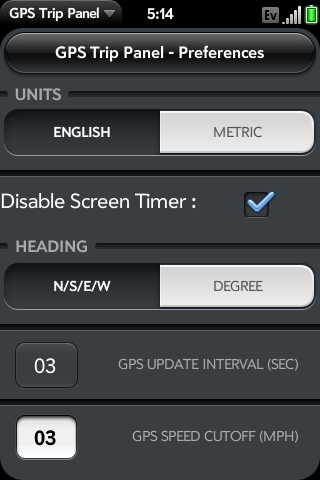 You can adjust the GPS update interval and GPS speed cutoff to help smooth out and deliver more accurate GPS data. With these features you can still expect good GPS data even in low satellite reception areas. 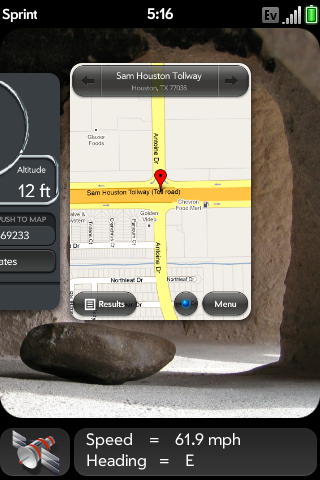 This app also delivers other great features such as displaying your coordinates. If you don’t think in coordinates, that is fine, simply tap the coordinates to push them to Google Maps. Google Maps loves coordinates and can even translate them into an address. These coordinates can also be copied by clicking the “Copy Coordinates” button. Once copied you can paste them anywhere. Memos is a great place to paste the coordinates for records keeping. 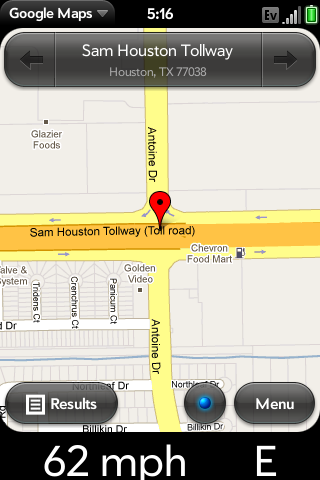 Another neat utility built into this app is the GPS message center. 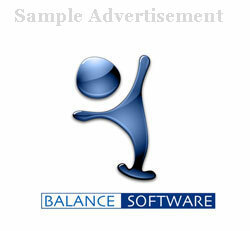 It uses a few custom algorithms to help keep the user notified of what the GPS is doing and its status. This can be very helpful to the user during times of low sky visibility where the gps might take a while locating or locking onto satellites. If you are using another GPS app that doesn’t keep you informed of your GPS status, simply open up GPS Altitude next to the first app and it will keep you informed. The app also comes with a built in error handling feature. If there is a major GPS error you will receive a popup of the error. Typically the user will be able to resolve the error with the information from the popup. If not, see below for a list of Q/A. Thank you for your interest in GPS Altitude. If you liked this app, think about making a donation to help encourage future development. I, Casey Broome, or L337tech.com are not responsible for any damage this app could or may cause to your phone or anything your phone is or may effect. This app should never be used as a sole navigation tool. This app should never be used as the sole navigation tool for flight, boating, driving, moving by foot, or any other transportation method where exact location is important. 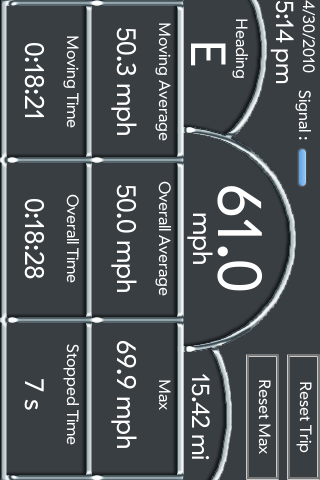 Mobile GPS’s can be wildly inaccurate. It is the sole responsibility of the user to use this app properly. Use this app at your own risk. Q) I can’t seem to get past the “Searching for Satellites” message. What can I do? Make sure at least 40% of the sky is directly viewable by the phone. Any obstructions, including a window may interfere. Start up the app when you are not moving. From my testing, the searching for satellites stage typically takes longer if you are moving around a lot. Q) I seem to be stuck at the “starting gps” message. What can I do? A) If this is happening to you, your gps has wigged out. Your need to enter/exit airplane mode or perform a hard reboot. Q) Sometimes when I open up the trip panel scene the application does’t display any numbers. What is wrong? A) This is a known bug cause by switching between the main screen, the preferences screen, and the trip panel real quickly. It doesnt always happen, its very random. This has to do with how WebOS handles opening and closing GPS tracking services. Hopefully future versions of WebOS will fix this issue. The fix is to either switch back and forth between trip panel and the main screen or to minimize the trip panel and open up the GPS dashboard/popup. Then, you will see that your trip panel began populating values again. Another fix is to open and close the app. Q) How do i get to the Trip Panel? A) Simply click the button with the arrow “<--" on it at the main screen. Alternatively you can select it from the menu in the top left corner of the main screen. Q) How do i exit the Trip Panel? A) The back gesture in the gesture area will take you back to the main screen. Q) Will this app work on the pixie? A) Yes and no. The main screen and preferences page work fine, but only part of the trip panel is visible. You wont be able to see the odometer/max speed/stopped time on the trip panel. Q) Why does the 2 second GPS update interval sometimes fail to work properly? A) This is a weird problem that I have yet to be able to solve. I will continue to work on this and keep the users informed if it gets fixed. One thing you can do that will occasionally fix this problem is press the reset trip button in the trip panel scene. I recommend using the 3 seconds update interval.